When I was in junior high, my friends and I were all caught up in the Zodiac signs and their meanings, so when the Penguin First to Read program offered me this book, I thought it would be fun to do a little reminiscing and the story itself sounded quite interesting. The world-building was amazing. At first, I had a difficult time getting into the world-building because it wasn’t just one world, it was twelve, each with their own terminology and culture. After my initial struggle, I was fascinated by the author’s imagination. I liked the importance Rho placed on family, friends, and community and her belief in unity of the signs, not separation. Throughout the book, there’s an element of mystery. Someone is a traitor and, although I have my suspicions who that may be, it was still unclear at the end. If a love triangle is required, Hysan and Mathias were good choices. Both are strong, good-hearted characters and I liked them more than Rho, for reasons stated below. Something I didn’t enjoy was the whiplash Rho’s character gave me. One minute she’s in the guardian mindset, concerned about the destruction in her world and the danger to others. The next, her world revolved around her feelings for Hysan and Mathias and the strength of those feelings seemed directly proportional to who she was with at the time. I lost respect for her character over the way she handled those relationships. 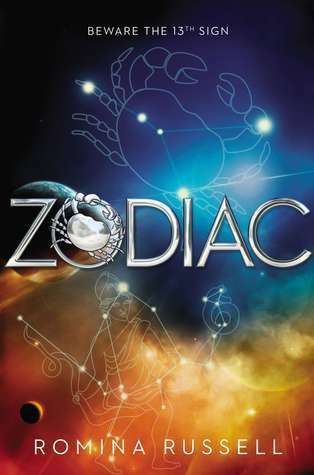 Zodiac offered action, suspense, and romance, and I’d like to see where the story goes from here, but at times, the romance overshadowed everything else, leaving the reader with a female protagonist who needed to be rescued.